"If they start out by talking about their sauces, walk away," he says. "And if you don't see the smoke ring, walk away." The smoke ring is the telltale sign that the meat has been done up proper, having spent hours in a wood-fired smoker. Kloby's particular smoker is from Mesquite, Texas and runs solely on a mixture of oak and cherry. 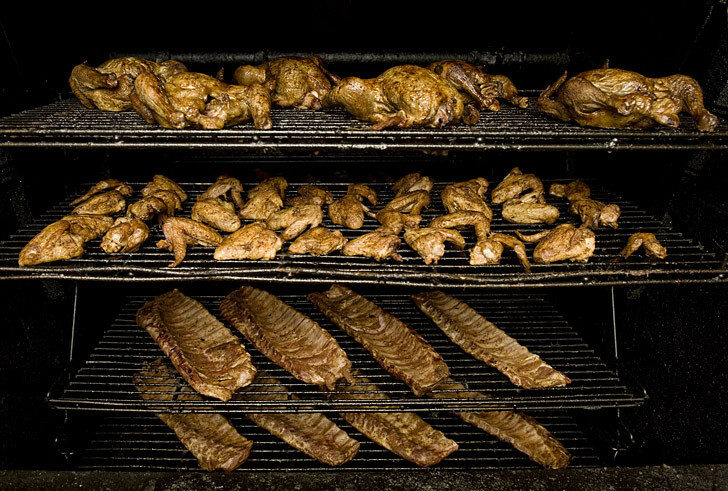 The selection shown above is a typical mix for the smoker. The whole chickens and wings are ready to eat. The baby back ribs are 30 minutes into their 4 1/2-hour tour. My recommendation? Try any of them, naked, with a selection of sauces on the side. That way you can see which combo works for you. The slow smoking and careful attention yields a taste that cannot be otherwise duplicated. Chicken and ribs aren't the only offerings, either. The pulled pork is also a standout. Figure on getting two meals out of one huge sandwich. I've yet to sample the brisket, smoked turkey, sausage, sirloin or beef ribs, but that will soon be rectified. Slow-smoked meat is its own reward, and Kloby's Smokehouse is Howard County's antidote to chain BBQ.